The Rockin' Road Report began in 2001 with a series of reviews of the opening week of Journey's Arrival Tour posted to various Journey communities. I also began writing articles for JourneyDigest.com, which is sadly no longer active. Eventually, reviews of other concerts would join the many Journey concert reviews and events. In 2014, I decided to collect them and related items in to one place, thus this blog. New reviews and commentaries will appear here too. The Beatles broke up when I was two. John Lennon was killed when I was 12. The only tour George Harrison did in my adult life was a brief tour of Japan in 1991. That leaves Paul and Ringo as the two remaining Beatles who regularly perform shows. I've seen Paul McCartney perform at least seven times, but it seems I always missed Ringo when he came through town. There were a variety of reasons -- other plans, tickets sold out before I could get them, etc. So clearly trying to get to one of his shows has been on my list for quite some time. Then a few years ago, Gregg Rolie (formerly of Santana and Journey) joined his All Starr Band, and I got even MORE motivated to try to go to one of his shows. That finally happened Friday night. I bought the tickets for this show about six months ago with my friend Mary. Between then and now, Mary and her husband moved to Portland, so we had to make some adjustments to our plans for the evening. Mary flew down Friday afternoon and planned to catch CalTrain to Palo Alto where I could easily pick her up from work. She missed her first train, so we wound up getting down to San Jose about 7:00 -- not a whole lot of time to grab dinner before the 8:00 show time. Since I knew we'd have a short window between when we'd arrive in San Jose and the start of the show, I grabbed a quick bite to eat and after we parked the car, Mary and I had a quick dinner in my car. Not exactly the plan, but it would do. We got into the Civic pretty quickly and found our seats, which were about 10 rows from the stage. Looking around, we were on the younger side of the crowd. There were some kids under 21, presumably at the show with their parents (or possibly grandparents), but for the most part the crowd looked to average around 65. We got settled in and chatted for a bit while we waited for the show to start. The biggest thing I noticed about our seats while we were waiting is that the rows were VERY narrow. You pretty much would have to get out of the row to let people get by to get to/from their seats. It got pretty annoying later once the show started and I wanted to stand up and dance a little. The show started off about 8:15 with the All Starr Band walking on stage first. I kind of chuckled to myself as Gregg Rolie was the first one out. Gregg was joined on stage by Steve Lukather (Toto), Graham Gouldman (10cc), Colin Hay (Men at Work), Warren Ham, and Gregg Bissionette. Everyone got a big cheer, and then Ringo came out to a bigger cheer and they all launched into "Matchbox," the old Carl Perkins tune the Beatles covered way back when. That was followed by Ringo's solo track "It Don't Come Easy." One more Ringo-led Beatles tune followed and then Ringo handed over the lead singing duties to his band members. I've gotta admit, the All Starr Band is a big reason I've wanted to see one of Ringo's shows for so long since in addition to hearing Beatles classics and Ringo's solo hits, you also get to hear songs from other well known musicians and their musical history. First up was Graham Gouldman. Now, I'm going to admit here that while I've known of the band 10cc for a long time, there is no way I could ever name one of their songs much less a member of the band. That's not to say I don't know 10cc songs, it's just that I don't have any association between the band and the songs. Thus led to the introduction of "Dreadlock Holiday" as a "hit song all over the world, except in America!" It's actually a song I know and would hear on KFOG before they went and blew up their format a couple of years ago. No idea that was a 10cc song! That was followed by "two time Rock and Roll Hall of Famer" Gregg and the Santana classic "Evil Ways." I've heard Gregg perform this a number of times now and I never get tired of it. Next up, was Steve Lukather, who along with Colin Hay, ensured there were songs in the set that were hits after 1980! Lots of clapping along to "Rosanna." Finally, it was over to Colin Hay (who I did not recognize at all until he was introduced!) and the requisite "Down Under." The show proceeded like this, with Ringo coming out front to do a couple of his numbers before turning things over to his band to do theirs. I really loved the energy Ringo had all night, but he has got to be one of the most awkward front men I have ever seen. He's clearly much more comfortable sitting behind the drums, which he did for a number of tunes -- both of his own and for nearly all of his bandmates songs. Around this time, I started doing a mental checklist of the Ringo-led Beatles songs trying to figure out what he'd be singing during the set list. First to pop in my head was the thought "Well, he'll have to do Yellow Submarine." And, yep, very next minute, there it was. It was great fun to sing along. "Yellow Submarine" is one of those songs I've just loved since I was a kid. It was kid-friendly way back when, and it still just puts a big smile on my face. Ringo took a bit of a break after that and went backstage while the band played "I'm Not in Love" (oh! another 10cc song I know but didn't know!) and "Black Magic Woman/Gyspy Queen" which totally rocked the house. Steve Lukather was incredible on the guitar and he and Gregg had a good time playing off each other. A third round of Ringo songs and band songs, and things started to wrap up close to 11 as the show closed out with "A Little Help from My Friends." I was thrilled to hear that live. I've heard Paul do "Sgt. Pepper's Lonely Heart Club Band" a few times and always wished it would morph into "A Little Help from My Friends," but it never does, so getting to hear Ringo perform it was special. Ringo dashed off stage after that, but the band stuck around for a bit and a minute later, Ringo was back out and singing John's "Give Peace a Chance." Great way to end the night! *Yes, I know all the Santana songs are covers of other people's songs. For this purpose, it indicates they performed the Santana version of the song. When the dates for Journey's tour were announced earlier this year, I took a look at the calendar and found that they'd be playing in San Francisco just a couple of weeks before my birthday. I shot off a message to Ana Marie who, like me, would be turning 50 within two weeks of the show. Ten years ago, we similarly celebrated a milestone birthday with a Journey show, but that one had a lot of mixed emotions to go along with our birthdays. This time, we could celebrate and be in a much happier place than we were for that show. Like 39, 49 has been a year of a bit of turmoil for me. Unlike that year, however, the changes have been mostly for the better. When the tickets for this show went on sale, I was unemployed for the first time since I was 19 years old. I got the ticket anyway, figuring that I'd have a job by the time the show rolled around and would figure out the logistics of a Friday night show when it finally did. I did find a new job not too long afterward and the negative of 49 quickly turned in to a positive as I'm really enjoying the new opportunity. As the show approached, I arranged my schedule with my manager -- I'd work from home in the morning and take the afternoon off so I could meet Ana Marie and Mary Ann who was flying in from Memphis for the show. Then I got a message from my mother. My uncle Will had passed away and his funeral was going to be the same day as the show. Will had been ill for a while, so his passing wasn't a surprise, but now I had to figure what I was going to do about the show. If I had been going by myself, I most likely would have skipped the show -- it would be a very long day to do both. Since I had planned to meet friends, I had to figure out the logistics of attending the services for my uncle and then getting back to the city in time for the show. So, I threw a change of clothes in my backpack and left it in the trunk of my car to change into at the end of the reception. That my family, and especially my cousins who had just lost their father, were all saying "Great! Enjoy the show!" made me feel better about the whole thing. In the end, I realized, that life is meant to be lived and even in sadness you can find joy. I got to the show in plenty of time to meet up with Mary Ann and her son and soon Emerson and Nicole swung by and we all got to chat for a while before it was time to head to our seats for Foreigner who were opening the show. It was only 6:00, but I was already pretty wiped out from a long day so we mostly sat through Foreigner while they did their brief set. It's been a while since I'd seen them and, as often happens, I had forgotten just how much I enjoy their music. I need to pull out their greatest hits more often. Def Leppard was scheduled to start at 7:30, so Ana Marie, her friend Leona, and I were up and on our feet as soon as the opening notes to "Rocket" started. Then the stage went dark. Hmm. That's not supposed to happen. There was some kind of power failure on stage and we had to wait about five minutes for things to get rebooted and start all over. Once things got rolling again, Def Leppard put on the kind of show I have come to expect from them. Big, loud, high energy, and just an all around rock show. I probably haven't seen them since the last time they toured with Journey 12 years ago, but the energy of their show is still great. While I never was a HUGE fan, I did always enjoy their music and seeing them again after a while was fun. A couple of highlights from Lep's set included the acoustic "Two Steps Behind" which was fantastic, and I can't help but be enthralled by Rick Allen's drum solo. It really never ceases to amaze me that he has managed to remain a drummer despite only having one arm. It's truly mind boggling. Their main set closed out with everyone's favorite stripper song -- "Pour Some Sugar on Me" -- which is always great live. They came back out quickly for a two-song encore of "Rock of Ages" and "Photograph" which are probably two of my favorite songs of theirs. Having the crowd sing along with "Rock of Ages" is always a cool thing. Another short break between sets and Journey came out around 9:40 to their hometown crowd. The second song of the set was "Only the Young", and at just two weeks away from 50 I can't really call myself young any more, but I definitely still feel young at heart when I hear that song. The chorus of that song has always put a big smile on my face. That I feel I'm in a good place in my life right now is also a good thing, and that song kind of reminds me of that. 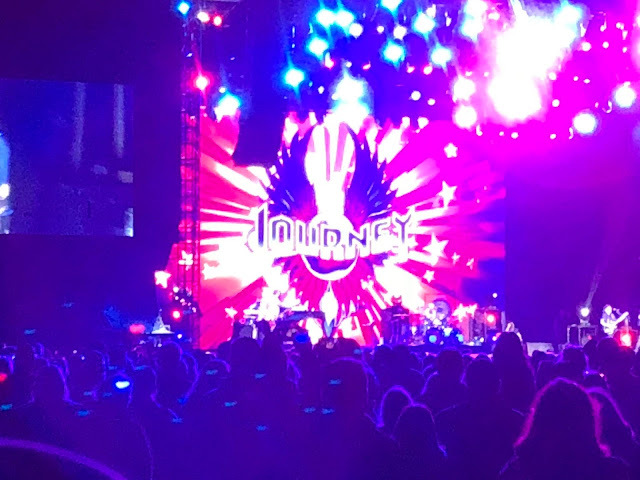 One thing I was wary of going in to this show was the memory of how Def Leppard totally blew Journey off the stage the last time they toured together. Their stage production just didn't hold up and the crowds were way more into the Lep's set than Journey's. This time around, Journey had a much improved production with a lot of animations of the old album covers that made for an interesting background. It wasn't quite as eclectic as Def Leppard's production, but it matched it fairly well I thought. Ana and I were both surprised when Neal began his introduction to "Lights" fairly early in the set. We had both expected it to show up later for the home town crowd. As he has been doing recently, he dedicated the song to Steve Perry, which I can't decide is touching or amusing. Maybe a little of both -- I've spent a long time in Journeyland. AT&T Park lit up their cell phones and it's a pretty cool sight to see. I always love hearing "Lights" in my backyard, that it's the third time I've heard it sitting a little over a hundred yards from San Francisco Bay just made it more special. Jon's solo later in the set was nice and it was fun to hear snippets of "When You Love a Woman" and "Send Her My Love." Ana and I both held our breath when the opening notes from "When You Love a Woman" showed up. The last time we'd heard Journey perform it was at that show 10 years ago. I've been listening to Trial by Fire a lot lately in anticipation of Steve Perry's new album, so it would have been great to hear it live again. I really love that Steve Smith is out on the road with Journey again. As much as I love Deen, there's just something special about seeing Smitty play and his drum solo was incredible once again. Some of the bits he included I've seen him do before in his solo shows, but that doesn't make his drumming any less spectacular. The show wrapped up a little after 11:00 with "Faithfully" and "Don't Stop Believin'," and for all that DSB has gotten overplayed everywhere in recent years, I can't not love hearing it. It's given me goosebumps for 37 years now, so I don't expect that to stop anytime soon. Ana, Leona, and I walked out of the show and parted ways a few blocks from AT&T Park as they headed to BART and I headed to my car. It was a very long day for me and I was completely wiped out by the time I got home (and took all of yesterday to recover, hence the Sunday RRR.) While the day started off sad, it ended in smiles and celebration and that's how life should be. And this party's just getting started... a few more fun times coming up as the countdown to 50 continues. Stay tuned! It's a little strange to be writing about a U2 show a little less than a year after my LAST U2 show, but that was an anniversary tour; last night was a new album tour. Fortunately, in addition to the ticket to the show, a copy of the new album, Songs of Experience, was included for download or CD with each ticket. Being back to work, I spent much of the last two weeks listening to U2's latest. I enjoy it, but nothing really leaped out for me as a must listen song. Hearing the songs performed live, however, definitely made them more impactful. The show was set up with the same stage and video screen that they used for their Songs of Innocence tour a couple of years ago. While the "wow that's cool" factor of having Bono and the band appear inside the raised screen isn't the same as the first time I saw it, it is still a pretty neat way of staging the show. My friend Mary and I had seats behind the main stage, so it was an interesting way to watch the big screen. In general, I've never had an issue with sitting behind the stage. Sure, there are the occasional blocked views due to cables and such, but overall it's an up-close experience with the added perspective of seeing what the performer sees from the stage. Unfortunately, the sound was distorted most of the night which I suspect was due to the speakers directed towards our seats being a bit too much for the short distance to the back wall and thus caused an echo. Getting the one and only complaint I had with the show off the list, on to the many different high points. We'll start with the opening of the show. Because of our seat location, we were able to see the band exit the backstage area and enter the space beneath the stage just before the show began. I kept watching to see where they'd come up on to the stage and wondering why they hadn't come out yet. Well soon the video screen, which had been showing images through out the pre-show time, began to change and the lights went down and the music started. Then there they were -- the whole band standing and performing inside the video screen singing "Love Is All We Have Left" (the opening track to Songs of Experience) with loads of energy. They followed that up with another new track, "The Blackout" before the band returned to the stage leaving Bono inside the screen for one more new song. It's always tricky when an established act is out on tour with new music. Long time fans are always waiting for their favorites and playing a bunch of new songs, especially right off the top of the show, can be tricky. Some performers can grab the audience with the new songs and bring them along, some can't. Fortunately U2 has Bono as a front man and he remains as dynamic as ever and the crowd was really into the new songs. This was a good thing as the show continued since the set list was heavy on newer material. (I suspect after having just done the Joshua Tree 30th Anniversary Tour which was all about the older, classic, beloved material, it was a deliberate choice to stick with newer songs.) That's not to say older songs weren't performed. I was stunned a little while later when "I Will Follow" was followed by "Gloria." It took me a minute to recognize it (mainly due to the distortion issues) and another few seconds to call up the lyrics from my mental database of songs. The crowd ate it up. The show moved on with more of the Innocence/Experience songs, with Bono heading back inside the video screen for "Cedarwood Road" which ran with animations similar to the Innocence tour. When the song ended, Bono descended from the screen on a little platform at the end stage. Larry grabbed his snare drum and started beating on it as the band walked out to the catwalk. A slow, measured version of "Sunday Bloody Sunday" followed. The video screen for this was filled with a combination of messages about peace and messages about when Ireland gained independence from England in 1916 and the "troubles" that followed. This was followed by "Raised by Wolves" a companion piece to the theme. One of the things Bono kept mentioning throughout the show is how Ireland finally found peace when they found compromise. Much of the show was from the perspective of someone from the outside holding up a mirror to America and saying both "take a good look at yourselves" and "remember who you are." There was an even more poignant moment in this regard later in the show I'll mention shortly, but with that theme running through out the show it really drew attention to the new songs and what they're about. Light in the darkness. Love is difficult but necessary for change. There was a brief intermission while a recorded version of "Hold Me, Thrill Me, Kiss Me, Kill Me" played and the road crew set up on the small stage for the next set. That opened with "Elevation" and Bono sporting a top hat, some white make up on his face, and no glasses. Energy levels rose with the tune and continued on the high end when the band launched into "Desire." Then Mephisto made an appearance in a very interesting animation for "Acrobat." My next two favorite moments came up next. With Larry and Adam back under the main stage for a brief break, Edge and Bono remained on the smaller stage for an acoustic version of "Staring at the Sun" which was amazing. Watching them I just imagined a couple of kids sitting in a garage somewhere in Dublin working out their first songs. I can't even say what evoked that feeling but it was likely a combination of the acoustic guitar and seeing a band I've loved since high school with a friend I've known since we were freshmen talking about music we loved. In contrast to that feeling, however, were the images on the video screen. Foremost among them were the images of the marches in Charleston from last year. All kinds of images of hatred and bigotry. They were really hard to watch, especially since I just don't understand that kind of feeling. That was compounded by a conversation I had with a friend's husband on Sunday. He's from Syria and we had a long talk about politics, religion, racism, and tribalism and how they're impacting everyone on all sides. In the end, we agreed that true freedom comes when we all recognize each others freedoms. So this was then followed up with a bit of "This Is Not America" as the band moved on to "Pride." I cried while singing my heart out on that one. Bono reminded us that it was 50 years last month that Martin Luther King, Jr. was assassinated and that his work still remains unfinished. The images on the screen were much more positive and encouraging including several that just said "Vote." The band worked their way back to the main stage (Edge and Adam having been on small platforms on the sides of the arena) for "Get Out of Your Own Way" and "American Soul" which I heard with different ears. The main set closed off with "City of Blinding Light" with a lot of colorful lights around the stage. Back out for the encore with more encouragement to compromise and love one another and to listen to the lessons of the past. "One" was followed by two new songs, "Love Is Bigger Than Anything in Its Way" (which Bono introduced by saying "this is the best line I've got") and "13 (There Is a Light.)" Both brought a lump to my throat, especially "13" which is a variation of "Song for Someone" from Innocence. It is a message we need to remember. New posts coming soon... I'm seeing U2 in a couple of weeks! I have a couple of different interests, so I have a couple of different blogs. Fortunately, "MNMsJrny" works for both. Initially, it was the user name I came up with participating in various Journey forums, so great for my Rockin' Road Reports (many originally published under that name.) It also works as I journey through the past in search of my family history, thus my second blog is called MNMs Journey! If you wish to contact me about either my adventures in Journeyland (and beyond) or about my family history, use the contact section below. © 1998-2018. All photos property of Michelle Murray except where noted. Awesome Inc. theme. Powered by Blogger.